Visit Reykjavik’s thriving puffin colonies on a 1-hour, small-group cruise in a rigid inflatable boat (RIB), and watch the brightly-colored birds swoop, dive and preen in their natural habitat. Board a nimble RIB in the Old Harbor, and skim across the waves of Faxaflói Bay. 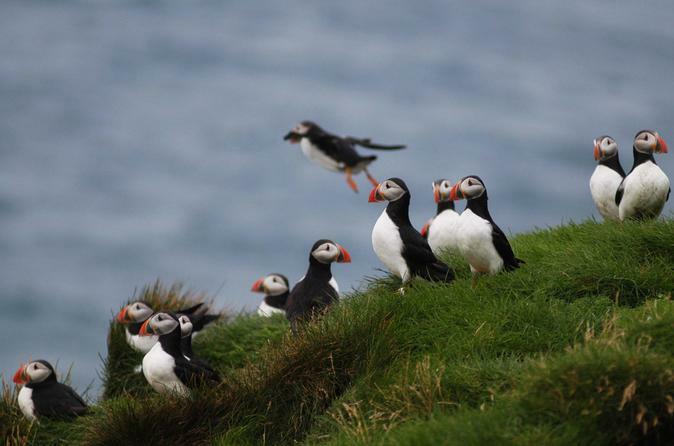 Watch for the auks, gannets, fulmars and Arctic terns that pass through Iceland’s rugged landscape and get an up-close look at puffins as you learn about the birds from your captain and guide. Bird watching doesn't get more rewarding than this! You'll cover lots of ground in an ultra-fast RIB, so you get more time to see the birds. Second, your craft is built to weave around all the rocky nooks and crannies, giving you fantastic, close-up views of the puffins.